We now deal exclusively in parts, accessories, service and repair for Harley-Davidson® and American V-Twin Customs. Although our facility and staff have grown over the years, we have adhered to our goal of making Jere’s Cyclecraft a place that our customers will always enjoy visiting. Our long history of providing the highest quality service is important to us, as is the trust we have earned from our customers. We have never forgotten that it is our customers to whom we owe our continued success. The coffee is always hot, and we cordially invite you to stop by for a visit. In addition to coffee, expect a well-stocked showroom, friendly service, and a pleasant and knowledgeable staff. After obtaining a BS from Georgia Tech and completing his tour with Uncle Sam, Jere began to ponder his future. Loving the sun and being an independent sort, he couldn’t quite see himself spending most of the day in a stuffy laboratory - and one belonging to someone else at that! With his strong background in analytical science and several years’ experience riding and repairing motorcycles - his own and those of close friends – Jere decided to try his hand at repairing motorcycles for a living. Boy, did that ruin a perfectly good hobby! Jere began repairing motorcycles on a professional basis in his father’s barn with Tom Johnson, a high school friend and riding buddy. The new business was named ACME MOTORCYCLE COMPANY. No stranger to wanderlust, Tom eventually loaded his mile long Panhead chopper into a rented trailer, fired up his hemi GTX and headed south for the sunny Golden Isles – lock, stock and barrel. With Tom and wanderlust still being on speaking terms he spent several years with S&S Cycle in Viola, Wisconsin and currently hangs his leather jacket in Daytona Beach where he frequently freelances for several motorcycle magazines. 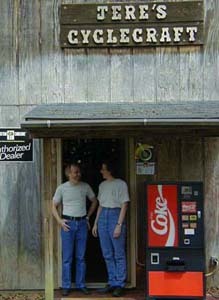 With Tom gone, the shop was reborn under a new name, JERE’S CYCLECRAFT, in June of 1973. It’s seems that many of our customers were not cartoon fans, and we tired of explaining the significance of ACME (Greek for “the pinnacle of quality”) and in tandem – Wyle E. Coyote’s lifelong search of anti-roadrunner paraphernalia. We chose the new name to reflect our belief that quality motorcycle work is a craft. Like all crafts, it requires not only a fair amount of skill, but also experience and patience. Seeking a symbol of these qualities, we settled on the lion which also represents leadership, pride and dependability, for our logo. With custom choppers being all the rage in the early 70’s, we ventured farther into customizing, painting (for which we no longer have the time) and selling custom parts. The shop soon acquired a cement floor – a truly wonderful advancement – and a new showroom complete with fancy glass display cases! Our business grew steadily and in need of more space and a larger, more modern facility, we replaced the poor ol’ tin barn with a larger building. To meet the challenge of continuing “business as usual” during the transformation, we decided to construct the new building over the old, and then tear the old one down and drag it out piece by piece. Bored? Try that sometime! We added new staff, all the while being careful to maintain the character of our company and the relaxed feel of the shop. Although larger than when we started, we will always remain small enough to serve our customers as we always have – on a one-to-one basis, with honesty and integrity. Put in the simplest possible terms, this is who we are. We cordially invite you to visit the shop and see for yourself. At the least, you’ll get a free cup of coffee and a pleasant ride. We have learned if you treat people with respect, they will reward you with loyalty. Because the foundation of our business is integrity and customer satisfaction, it is our customers who should tell you what we have to offer you. True, we did solicit this opinion, but only because we knew Nick is at ease with a pen. Our only instruction was for him to write about why HE comes to Jere’s Cyclecraft. His comments are unedited. Be mindful that this was written in 2000, so references to time and his location may be inaccurate or outdated. "I have been invited to write a customer perspective for Jere's Cyclecraft. I now live over four hours from Atlanta and I continue to head back to Jere's Cyclecraft whenever I need anything major. This is pretty significant when you realize that Ellie McPherson or Bridget Fonda don't work behind the counter. There are several things that this shop does, and other shops only pretend to, that builds this kind of dedication. The first is the terrific amount of knowledge that Jere has acquired over the last 27 years in business (now almost 40 years), knowledge that he will take the time to share. There are many shops that have a lot of experience but finding a shop that will really slow down and share that information is rare. Jere has an incredible knowledge of what options are available. This is a result of spending the cash to attend industry trade shows, stocking a sizable assortment of aftermarket parts catalogs and decades of working with individuals customizing their bikes. A couple of months ago, I canvassed every shop in my local area and asked if they knew of any manufacturer that made a particular part I needed for a custom bike. Everyone told me I would need to have this particular part custom made. One call back to Jere and I knew who made what I needed, without the expense of a "one off" fabrication. The amazing thing in this day and age, is that his advice isn't affected by his profit margin. More than once Jere has steered me away from a contemplated "upgrade" that would have made some money for his shop but not done much for my bike. He knows which aftermarket parts are better deals than the stock Harley parts, and which are not. In some cases the stock Harley part is a less-expensive, higher-quality alternative and Jere will let you know that too, even if it means you go and buy the part at HD of Atlanta instead of buying the part from him. 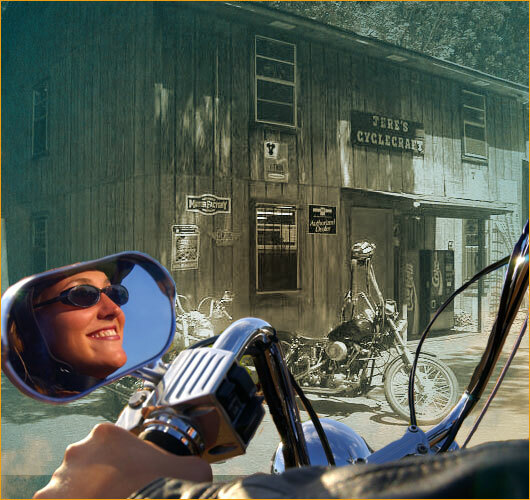 The entire philosophy of Jere's Cyclecraft is long-term customer relations. Beginner to advanced rider- this is the shop where you can ask a stupid question and Jere never makes you feel like you asked a stupid question. It is a place I feel comfortable recommending, because it is a shop in which I have always felt comfortable." "The Horse" - "Back Street Choppers Magazine"
Copyright© 2012 Jere's Cyclecraft. All rights reserved.